This is from a few months ago but after watching Batman Beyond (as well as G.I.Joe Resolute and episodes of Super Friends, Plastic Man & X-Men) over the weekend I realized that I never got around to posting this sketch of our pal Terry McGinnis. happy belated birthday, chris! hope you had a great one! this image is fantastic! i love the design of terry's batsuit, and you did a great job with it... the splashes of red were a great idea as well. i also love the inclusion of bruce in one of the trashed monitors. very cool! Hope you had a great b-day weekend Chris. 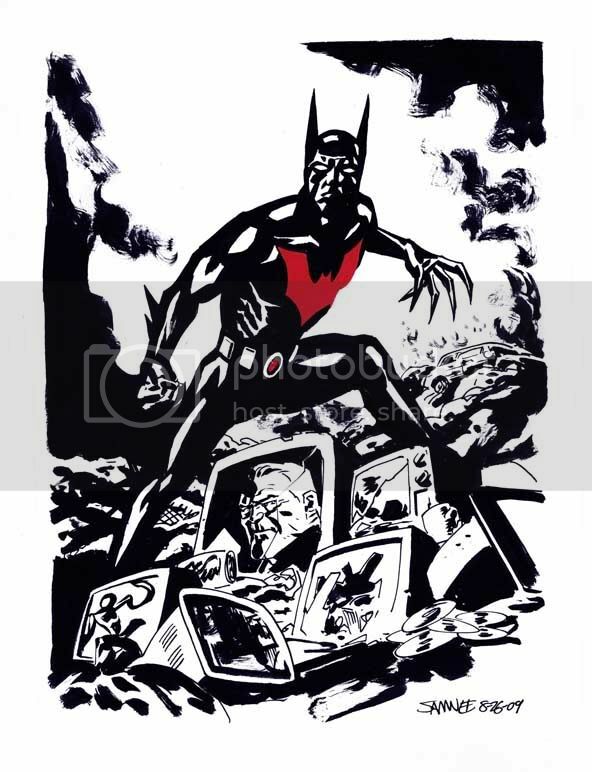 This shot of Batman Beyond is awesome. Love the fact you added Inque into one of the smashed monitors as well. Full Circle!! Just had lunch with one of my best friends and he handed me the Windy City Batman piece as my Birthday present!! Yeee-ha! I like this Batman Beyond, his costume looks great! Wow great artwork!! I love how you positioned the character. You should make a comic book out this character he could be the next 'big' hero! WUAUUU IT´S AWESOME!I always love that serie. Hands-down, the very best Beyond version of Batman's costume that I've ever seen, and that's not just hyperbole. The junkyard mosaic elements are truly inspired and a unique idea that I haven't seen before. I'm very impressed. And thanks for all the kind words on this old sketch!! This is awesome! Alex wanted me to tell you that!! I heard they gona make a Batman Beyond Movie. Taylor Lautner gona play Terry McGinnis / Batman.